Manchester United defender heading for Ajax return? Daley Blind on the move? Manchester United defender Daley Blind could be offered a return to the Eredivisie with Ajax after failing to establish himself under Jose Mourinho. The Dutch footballer joined the Red Devils from Ajax after a strong World Cup display in 2014 and he has since made 141 appearances for the club across all competitions. Despite this, he has largely been in-and-out of the starting lineup in recent years and he managed just one Premier League start for United between September and May last season. According to De Telegraaf, Ajax are supposedly planning an attempt to sign the versatile defender, who began his career in Amsterdam and appeared 125 times for the club. 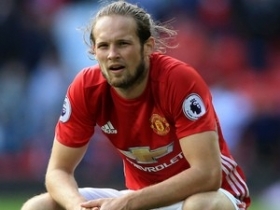 Earlier in January, Blind witnessed his United contract being extended until the summer of 2019 but the move appears to have been done with the aim of recouping transfer funds from his sale. Apart from Blind, Matteo Darmian is also expected to head through the exit door this summer with Juventus said to be in discussions over a potential return to Turin.